Building on the foundation of his 1991 publication “Echoes In Time” noted music historian and filmmaker Timothy Gassen presents a newly updated and expanded edition of the book, rechristened “The Knights Of Fuzz” in 1995 and subtitled “The Definitive History Since 1980”, as well as a companion DVD of the same title containing a documentary film featuring 19 music videos recorded between 1983 and 2006 and some interesting radio spots. What we have here is nearly 25 years worth of work distilled into 500 pages of text, featuring updates, new feature articles, interviews & photos and an 80 minute DVD subtitled “Volume One: The United States & Canada” suggesting the possibility of future volumes to follow. This marks the welcome return of “Knights” to paper book format, after CD-ROM versions were released in 2001 and 2006. The book opens with an 8 page essay titled “It Was 30 Years Ago Today?” which serves as an incredible introduction to “Knights” as well as an excellent overview of the subject matter at hand. Always succinct, Gassen’s words are both well chosen and well documented. A 225 page chapter follows, bearing the work’s original 1991 title, “Echoes In Time” and subtitled “A Guide To The Essential Bands:1980-1995.” This chapter has been completely updated and there are alphabetical entries for hundreds and hundreds of artists, with entries containing bands’ names, their hometown and country, the titles of relevant releases including the number of songs included and the year and label of their original release. The entries vary in length, but often include an analysis or band history and reference official video releases of significance. This section of the book is wonderful for browsing and perusing and you will return to it often, that much I can assure you. Readers will welcome the “1995-2014 Global Updates” chapter which contains both updated and new entries. A wonderfully interesting 35 page chapter covering compilation albums, cassettes & flexis is next up. The comp entries include the number of songs, date and nation of release, artists included and informative descriptions where possible. This chapter is a great for locating obscure artists from around the world. There is one caveat, which Gassen makes clear from the get go, this is not an encyclopedia and is not meant to document each and every garage-psych band or release since 1980. That said, there are literally hundreds and hundreds of entries to peruse. One of the most interesting sections of “Knights” is the chapter devoted to “The Underground Fanzine Movement.” Gassen does an incredible job of gathering together information regarding fanzines from around the world, including his own “The Psychedelicatessen” which had 5 full length editions between 1986 and 1990 and included interviews, photos and reviews. Readers will recognize many titles here, but almost certainly discover unknown gems. In addition, the final chapter of the book includes reproductions from the author’s fanzine, articles and interviews alike, a delightful touch and a nod to the wonderful paper fanzines that the author obviously adores. A chapter is devoted to feature articles written by Gassen. Topics covered include playing live at The Cavern Club, a review of The Nuggets box set of 1998, and an interview with Bomp and Voxx Records owner Greg Shaw. The feature articles are always informative and succinct, a great combination. Guest authors are included and offer their views on the global neo-garage & psych music scene, covering US, Canadian and Dutch scenes specifically. The author also encourages communication with readers. To this end, “Fan Submitted Updates” gives music lovers a chance to participate in the festivities and adds much information and flavor to the volume, not to mention the many artists to be found here who supplement those included elsewhere in the volume. Add a heaping helping of photos throughout, including two chapters devoted specifically to album artwork and you have one of the most informative as well as enjoyable reads available to fans of garage and psychedelic rock from 1980 to the present. Beyond that, this is a wonderful place of exploration for those wishing to bring themselves up to speed on the state of the garage/psychedelic rock scene in 2015! Ah, but that covers only the paper edition of “Knights Of Fuzz.” To maximize your fuzzed out musical experience a companion DVD, of the same title, is also available that contains a documentary film by Gassen. The film opens with a short introduction by the author, who then introduces and comments on the 19 music videos included, which are indeed a wonderful overview of “the new garage and psychedelic music explosion.” The opening video by The Chesterfield Kings, “99th Floor” from 1983 sets the pace for what is to follow. 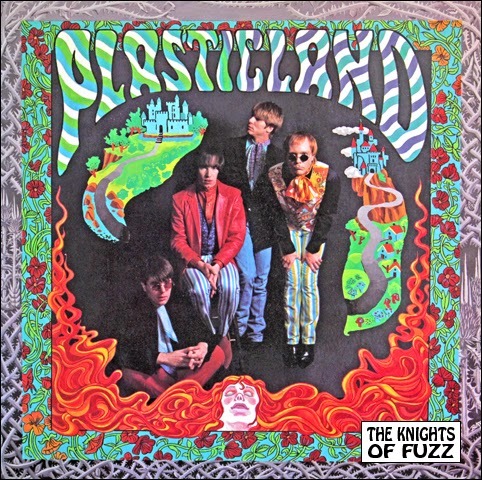 There are no weak links among the videos, but a couple I really enjoyed were “Ward 81” by the Fuzztones from 1985, a live performance of “Color Appreciation” recorded by Plasticland in 2001 at a New York City release party for the CD-Rom version of “Knights” and the 2006 performance of “Psilocybic Mind” by the author and his band Marshmallow Overcoat. Bonus videos include inspired live performances by Cheepskates and Vipers. The DVD ends with the short radio reports previously mentioned. 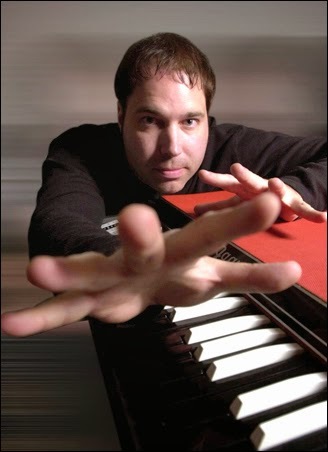 Of special interest are a couple of spots featuring Bomp and Voxx Records’ Greg Shaw, who shares the story of why he opened The Cavern Club to create a local scene! You simply cannot follow an act like that and Shaw’s words bring the film to a fitting end! Hi Tim, where did you grow up and were you involved in the local music scene? You have been a member of numerous bands, including many years in Marshmallow Overcoat. Would you discuss the bands you have been a member of and your role in them? I started out founding a New Wave band in 1982, named Jacket Weather, while at college in Tucson, Arizona. It was influenced by then-new sounds like Joy Division and Kraftwerk, and was two Casiotone keyboards and real bass and drums. That’s about as opposite of the garage-psych sound, but today I still like our “minimal wave” or “cold wave” sound, as its sometimes called today. We had a 7” EP in 1983 and our vinyl LP came out just last year! 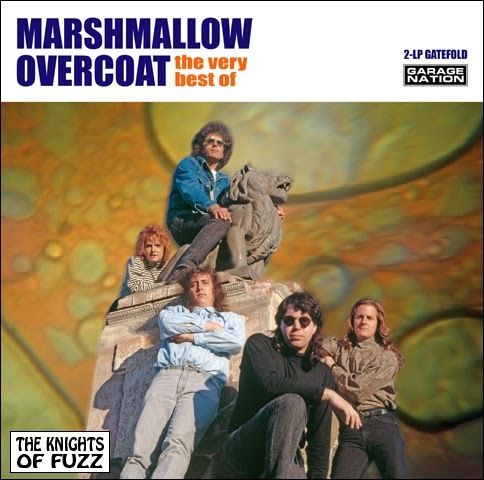 The Marshmallow Overcoat blasted garage-psych for a full 25 years, 1986-2011, with nine albums and a 2-LP “Very Best Of” out now. The Purple Merkins was a side band from the 1990s, and we had several 45s and an album, now available on CD and download. Crude ’66 garage there, bruthas and sistas! For all of these bands I was the vocalist and main songwriter and studio producer. And I took out the trash, too. 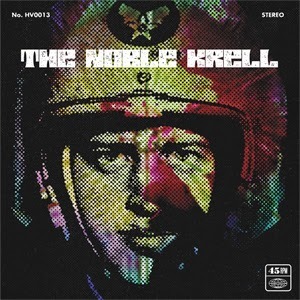 Today I produce a new band Tucson named The Noble Krell, and their debut 45 came out just now (late February 2015) on Hidden Volume Records. I am VERY excited about this new band, and I hope to have them back in the studio soon for a follow-up session. You published a fanzine “The Psychedelicatessen Magazine” in the middle to late 1980s. What was the inspiration for the publication? How many issues were published and what topics were covered? Do you foresee any fanzines in your future? You have, and continue to play numerous roles in the music industry. How long have you been involved and how has your role changed over the years? How do you manage to wear so many hats? Yes, I have been or am an A&R record company guy, producer, songwriter, publisher, liner note writer, record reviewer, feature writer, book author, radio show host, music video director, etc. I’m able to do all of these things because of my professional background in media, including journalism, film and video production, marketing and more. Just thinking about all of that made me tired! What inspired you to write “Echoes In Time?” Would you discuss the transformation of that title into “The Knights Of Fuzz?” How has “Knights” evolved and what has determined the format the work is released in, CD-ROM vs. paper book and DVD? There was so little media coverage of the neo-garage-psych scene in the 1980s, and I feared that history would be lost. So by 1991 I had accumulated enough information to create the first book, “Echoes In Time,” published by Borderline Books in the UK. If you can find a copy of that now it’s worth quite a lot! 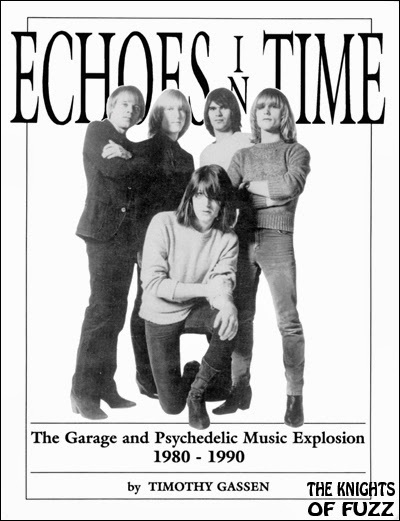 The first book brought a LOT of new sounds and info to me, as I suspected it might, and it became clear to me that those who continued the garage-psych sound were quite valiant, doing what they loved despite all the obstacles. They seemed like “knights” to me, warriors of The Fuzz! 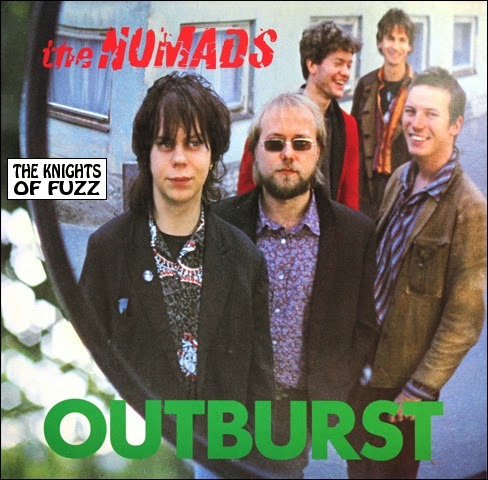 So that how “The Knights of Fuzz” title came up, and since the 1995 book that’s been the name for all of our efforts. By 2001 I had another generation of info, much of it video and audio, so that’s why a CD-ROM was the format. I wanted to add much-better quality video, so that’s how the 2006 DVD came about (plus I operate a film production company and was able to do the work). How did you select the bands and videos included on the DVD? A lot was determined by which bands would give me permission to use their work! There were several bands I really wanted on the DVD but they wouldn’t give me permission. But I am delighted with all the fine bands that DID wish to be included, especially The Chesterfield Kings, Fuzztones, Plasticland and Miracle Workers — those were my dream bands to get on the DVD! What is going on in the life of Timothy Gassen that It’s Psychedelic Magazine should be aware of? What is your role in the music business today? I am hoping that one of your readers is interested in investing in an intelligent sci-fi thriller feature film I am developing now. That film hopefully soon will take over the life of Timothy Gassen, if I can find the money! As for music, I continue to write and produce sessions. After all, Greg Shaw didn’t name me “The Guru of Garage” for nothing! Any parting shots or topics we didn’t touch on that you would like our readers to be aware of? I encourage all current garage-psych bands to SUPPORT EACH OTHER! I sense a lack of togetherness in the current garage-psych scene, and bands are not helping each other or listening to each other like they should. Many musicians from the 1980s neo-garage scene have expressed similar sentiments to me. I am a fan of HUNDREDS of other bands, and I try to help as many as I can. We need more kids with THAT attitude if we hope for this music to survive and thrive… Oh, and please buy some of my records and the new Knights of Fuzz book. I do need to eat so I can review more records! 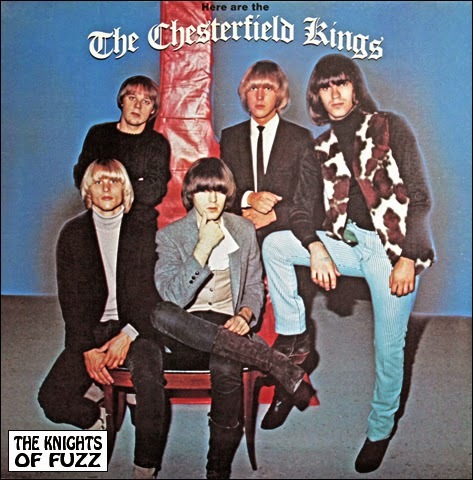 The Knights of Fuzz book is also available through many different countries’ local Amazon page, which can be the least expensive way to purchase this very heavy 500-page book. 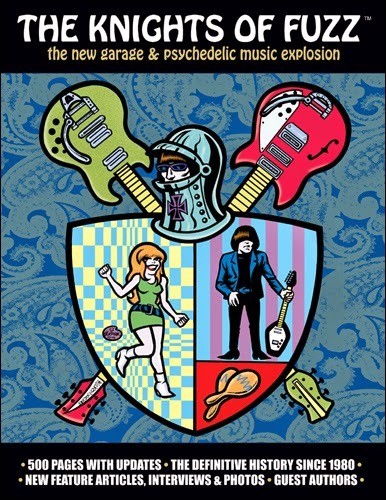 Thanks again for taking the time for this interview and congratulations on the 2014 paper book and DVD releases of your classic work “The Knights Of Fuzz!” Both should be essential elements of garage and psychedelic music lovers’ collections, especially those wishing to bring themselves up to date on the state of the garage/pscyh scene worldwide. Great photos! I will go to the concert next week to take the as great photos as that one. I hear it is the easiest way. On the resource like that you can get all informations about music events what coming soon. You can buy Kraftwerk tickets and check it on the resource.